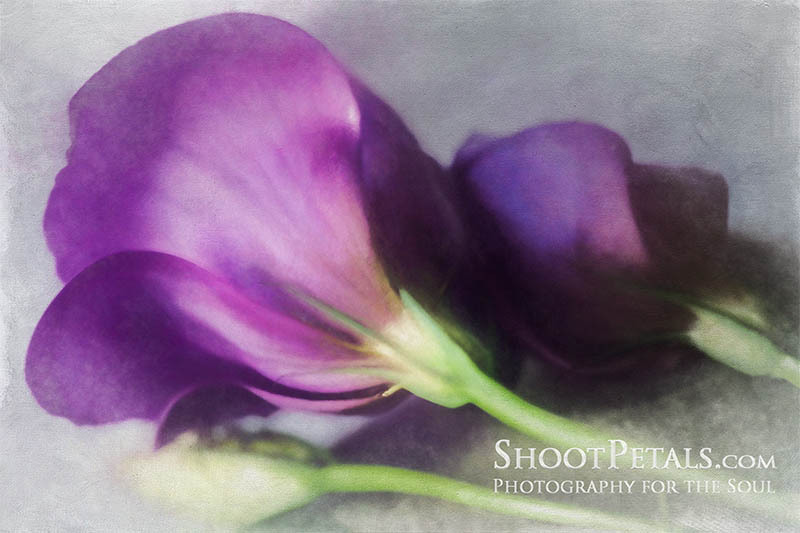 Who doesn't want to create stunning flower photography? But, how do you get to 'stunning'? Can you consistently create a technically correct image? That means the exposure and composition you wanted, not just a one-off. Great, you're a star... but, hold on, that still doesn't make your photo fabulous. You know your basic photography theory... check. You know all the bells and whistles on your camera... check. 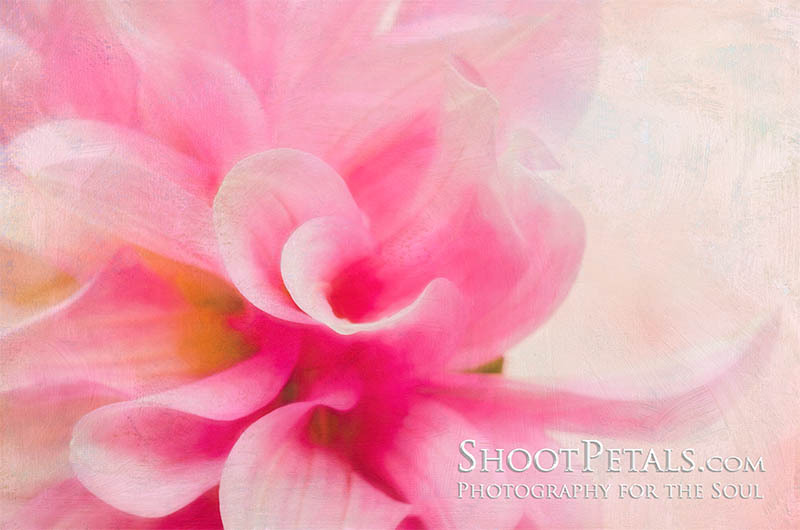 Soft pink and fuchsia toned dahlia for a painterly image. Topaz Impression and textures. To be successful, a photo has to be engaging. Just like writing a story. No one reads a boring book, no one cares about a ho-hum picture. It must build an emotional connection with the viewer. Then, an image must be inspiring... If we inject emotion into our photographs, we have a magical opportunity to teach and influence people who see our images. You may not think of yourself as a teacher but you are, every time you share your photos with friends and relatives, seize the opportunity to teach something they didn't know. Inspire them to garden more, visit a distant alpine meadow, learn photography and photograph bees in the lavender bushes. So, a stunning photograph is technically correct, engaging and inspiring. To photograph nature, we have to go out with an aware, inquisitive mind. And If you're looking for a more peaceful, connected life, flower photography may be exactly what you're searching for. Mastering the art of photography requires energy and a commitment to learning. And even though you have to understand the theory and technical aspects, those are only part of what makes great photographs. The rest is intangible, intuitive... and calls for focus, consistent practice and a fun-loving attitude. And you have what it takes. A Simple Home Studio isn't only for when it's cold, wet, and uncomfortable. It's also great for being able to control the background, do away with wind, and control the light. So retreat into your own photography studio, which can be as simple as a counter in your kitchen. I have some advice for that. Painterly Photo Editing for the artistic "painterly" look that I love so much. Stick around and see how Photoshop and other programs that make it easy to turn your photos into 'paintings'. I'll give you ideas of what you can do to make your flower photography look unique. Learn basic flower photography and photo editing - take amazing photos that tell the stories you actually want to tell. Photos that get a "Wow, did you really take that?" The Spiritual Garden... How many places on earth are as peaceful and as close to heaven as a garden? Maybe you call that energy "God", or maybe you use a different name. To me, it's Spirit. 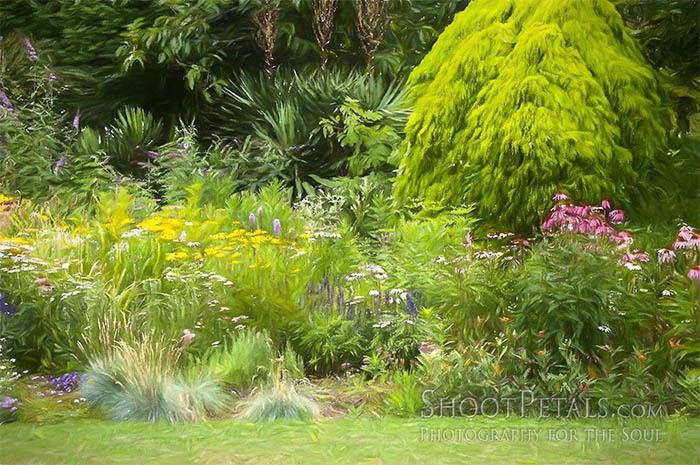 When I'm in a garden, that energy hovers all around me like a comforting blanket that I wear the rest of my day. Lovely soft butterfly on a pink flower. Photo edited in Topaz Impression for an artistic painterly image. 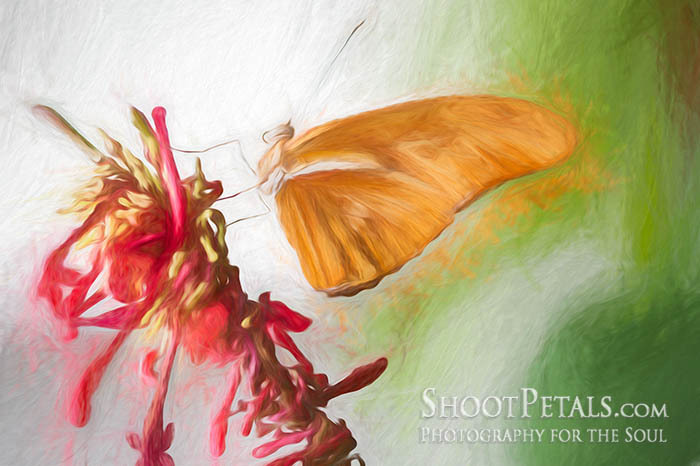 Photographing butterflies has it's challenges and I'll help you. Butterflies have been called "flying flowers" or my favourite nickname "flutterbys". Without butterflies, bees and the multitudes of pollinators, there would mean no gardens. They're so special you should Include them in your flower photography. We need to become more aware about the poisons we're feeding this earth and how they're killing off the pollinators, like the butterflies and bees, which are responsible for our diverse food supply. A camera is a tool to teach us about the flowers, the animals and insects that are all equally important members of our natural world. Video - a super way to catch movement, like those dashing butterflies. Want to remember what your garden looked like in the best blooming year ever? Capture it with either your cell phone camera or your DSLR. On the internet, video rules. That's because it engages our eyes, our ears and embraces our emotions! A super way to tell your story and you'll use all your photography skills like exposure and composition. I know you can do it... it's not as difficult as you think and it's fun. And you don't need to build an hour's documentary... keep it short and sweet, one or two minutes will do. Watch this video so I can share some of photography with you. As a bonus, I tucked in a few videos within the video! The whole picture show is just shy of two minutes... I hope you'll watch it. Full screen is best. Information about Gardens, Festivals and Celebrations from all over this amazing world of ours. And , woo hoo... guess where that leads? From time to time, I'll be on the move, leading Guided Tours to photograph some of the most magical gardens of the world. A vacation you've been dreaming of... interested? We'll spend time touring some of the most famous gardens of the world, meeting new friends, learning more about flower photography and having a whole bunch of fun! Glowing purple freesias in window light. A 35 mm slide, scanned and lightly edited in Photoshop. Photo Editing - I love to work in the digital darkroom. When I first started, I was so nervous ... like I was going to blow up the computer or something! I persisted in hours of learning and practice and I just kept getting better and better at creating beautiful art from my flower photography. Would you like to learn to turn your photos into art? Flower symbolism... the flowers have a language all their own. What flowers (and their colors) mean is sprinkled all through these pages. So, pick up a few ideas here to make your next bouquet speak in poetry for you! If you want to stay up to date with news, garden tours, my latest photos, photography tips and more.... sign up for my weekly e-zine, PHOTOGRAPHY FOR THE SOUL. >>> Click here to go straight to the sign up page. <<< Or use the form below. Keep up with what's new by reading my blog page. Sign on to your favorite RSS feed reader and get information as soon as it appears (special postings, too). RSS is explained on the blog page or in the right hand column on this page. Click on the tiny orange square beside "RECENT ARTICLES". Follow my Facebook page, GLENYS MORGAN PHOTOGRAPHY. I'd love to see you there. If you enjoy my work, please give the page a LIKE. You could also hit the Like button at the top of this page. And please, can you leave me a comment on the bottom of any page of my website? I'd appreciate your thoughts about what you've experienced here. The process of flower photography is MEDITATIVE. Everything in the garden... the birds and their songs, the water features and garden art, the plants themselves, create an environment that tickles and exercises all our senses. As nature photographers, our goal is to create stunning, engaging and inspiring photographs that teach and encourage others to tend to all of Mother Earth as they would their own small garden. Maybe you can't get to a garden today. No worries, there's always a flower nearby. Even one tiny flower is a captivating subject through a camera lens. A delicate little flower pushing up through the concrete and reaching for the sun has its own story of strength and courage! P.S. Is there something here you love... want more or less of? There's a Comments Section at the bottom of every page. I'd appreciate it if you'd let me know if there's something you'd like to see or learn about. Just one last thing - please share this site with other flower photography enthusiasts! Many thanks for doing so.